Stir together teriyaki ingredients well. If you don't want any chunks in your sauce, pulse it in a food processor until mostly smooth. You can also cook it down some in a medium saucepan if you want a thicker sauce. Clean shrimp well and devein if necessary. Then add shrimp to marinade and let sit for 10 minutes. Be sure to pour off some of the marinade for a sauce if you want to use it later. Preheat grill to high heat and skewer shrimp on 4 skewers for kabobs. Add skewers to grill and cook over high heat for 3 minutes. Then flip and cook for another 2 minutes. Brush the shrimp with the marinade as they cook. 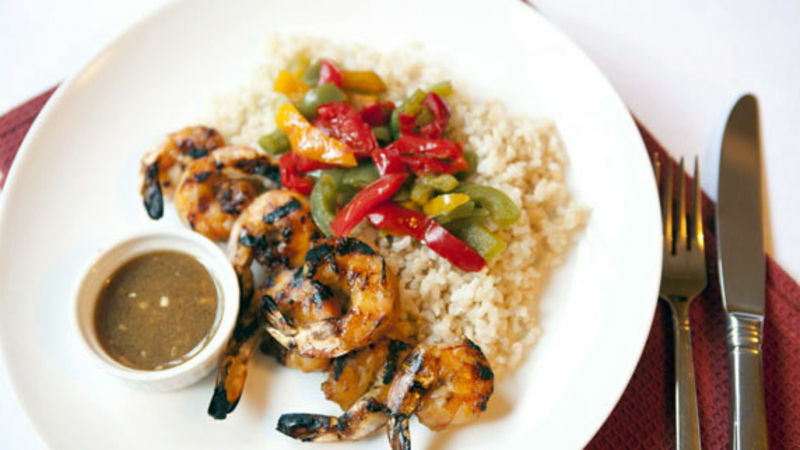 Serve shrimp immediately with rice and steamed veggies. We bet you didn’t know that making a completely from-scratch teriyaki sauce was this easy! It’s true, with just a few ingredients, you can make your own teriyaki sauce. Make it for these shrimp kabobs and we guarantee you’ll find endless recipes to use it with, like chicken or beef. This sauce is the key to all of your summer grilling, especially when you’re making any type of kabobs. If you didn’t buy already-deveined shrimp, learn how to devein shrimp with our how-to guide.